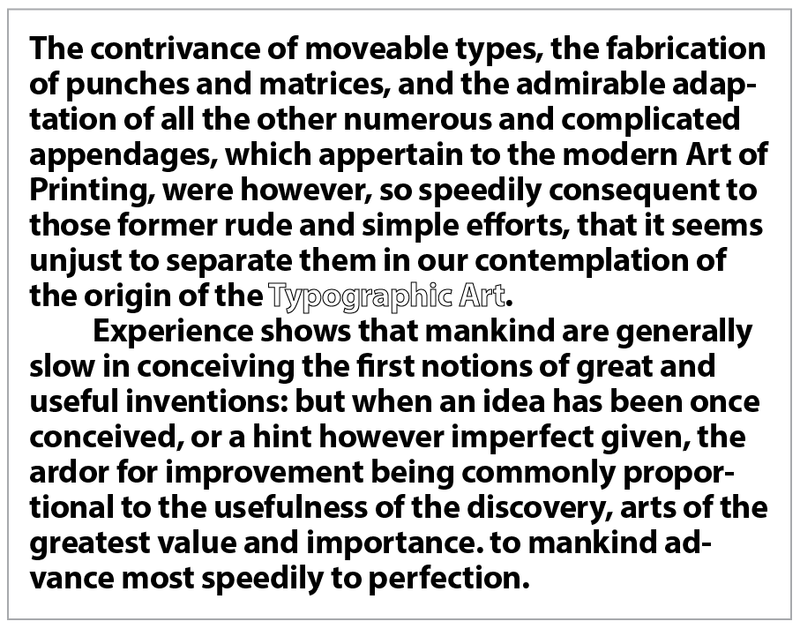 Learning typographic usage may seem like the simple application of common sense and visual sensibility, especially when it comes to rudimentary typographical practice, however it’s not so straightforward. 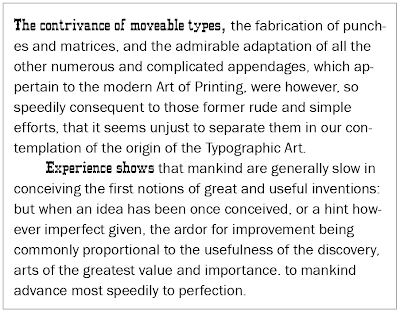 There are volumes of research that have been generated about the readability, legibility, and visibility of typography as it applies to paragraph bodies of text in theory as well as in practice. 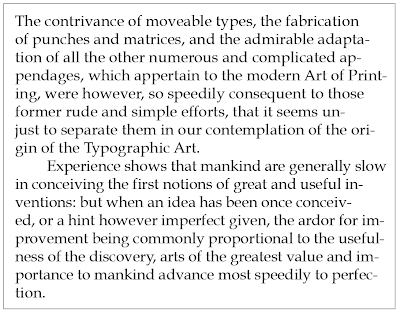 The following text "don't and do" samples demonstrate a number of basic principles that are essential for setting text that performs suitably in paragraphs with the potential to be as aesthetically pleasing as conditions will allow. 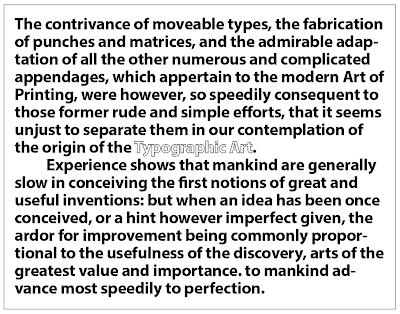 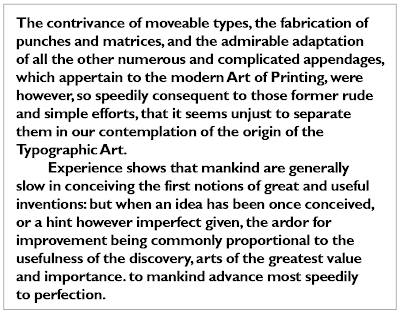 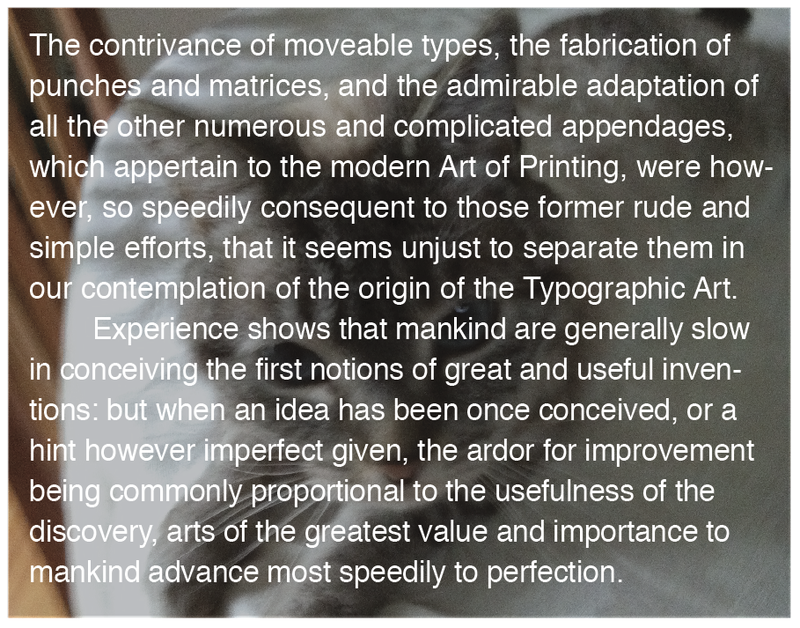 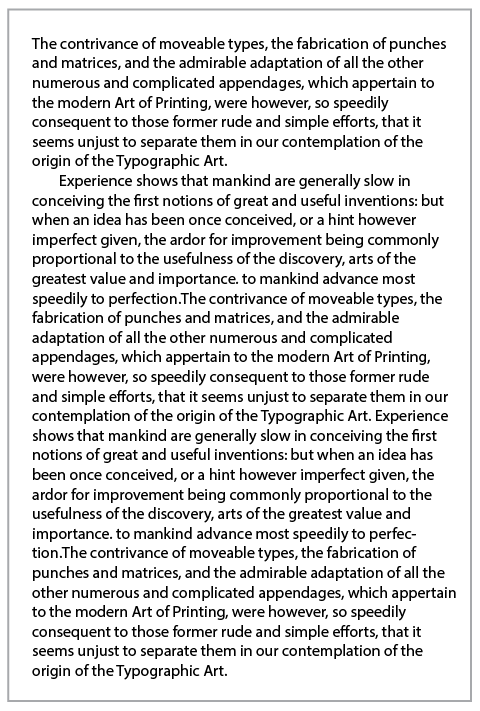 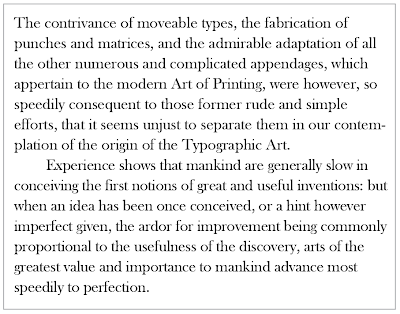 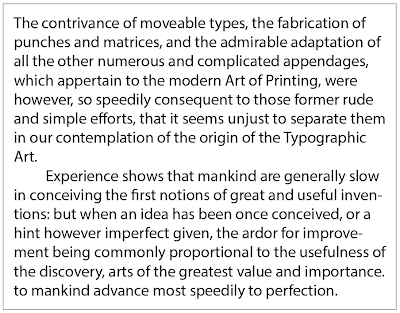 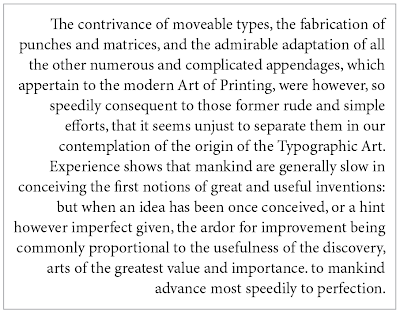 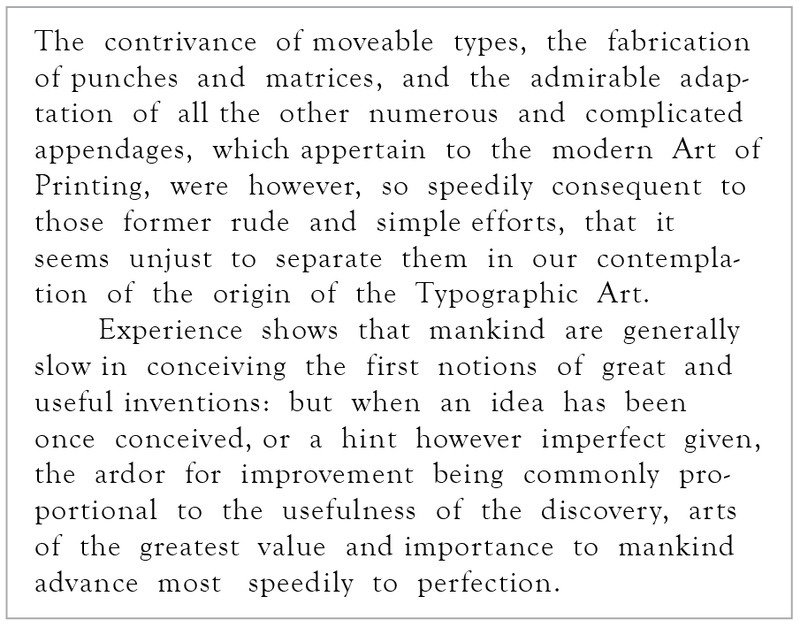 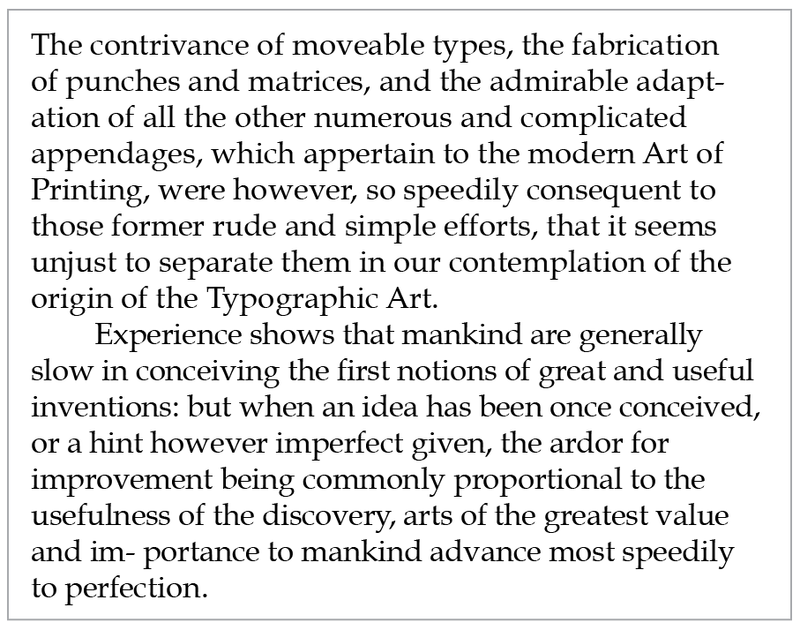 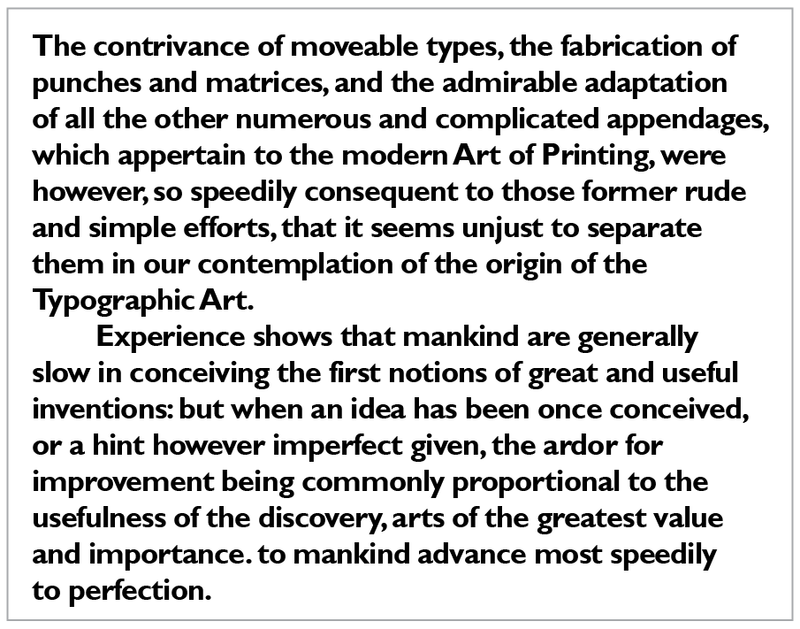 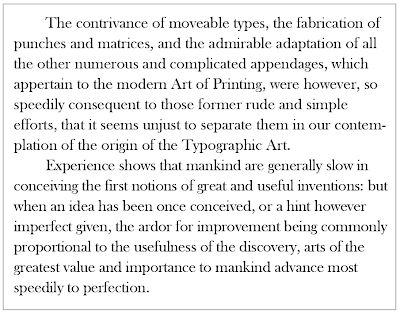 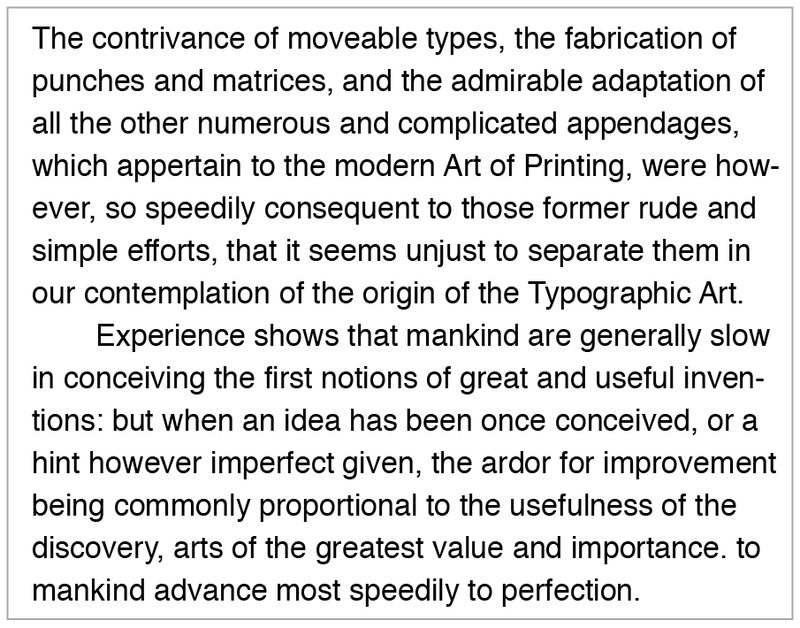 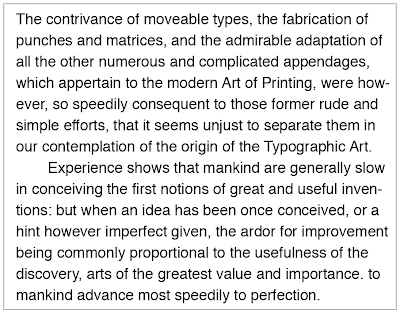 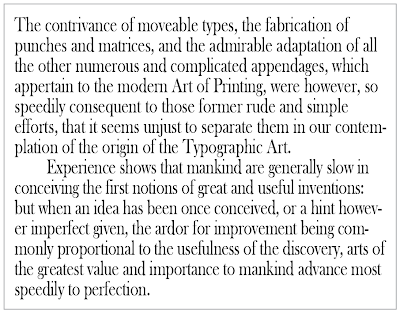 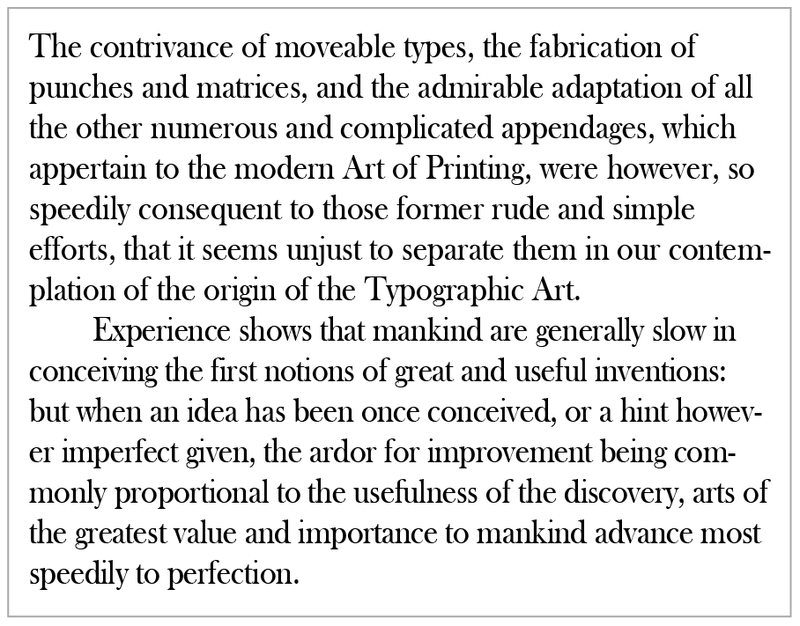 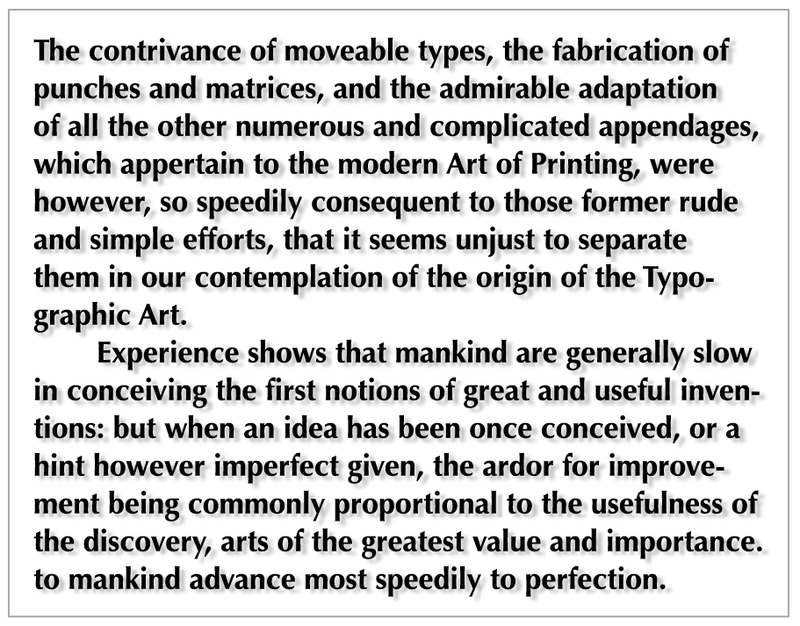 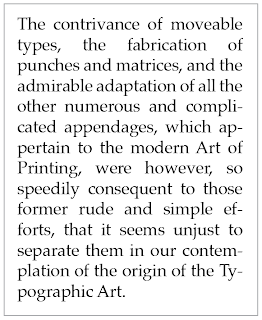 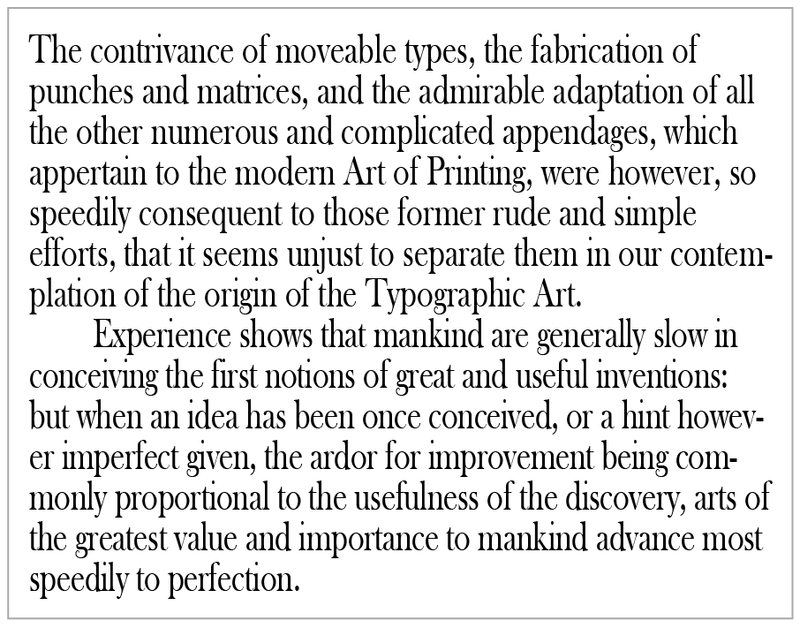 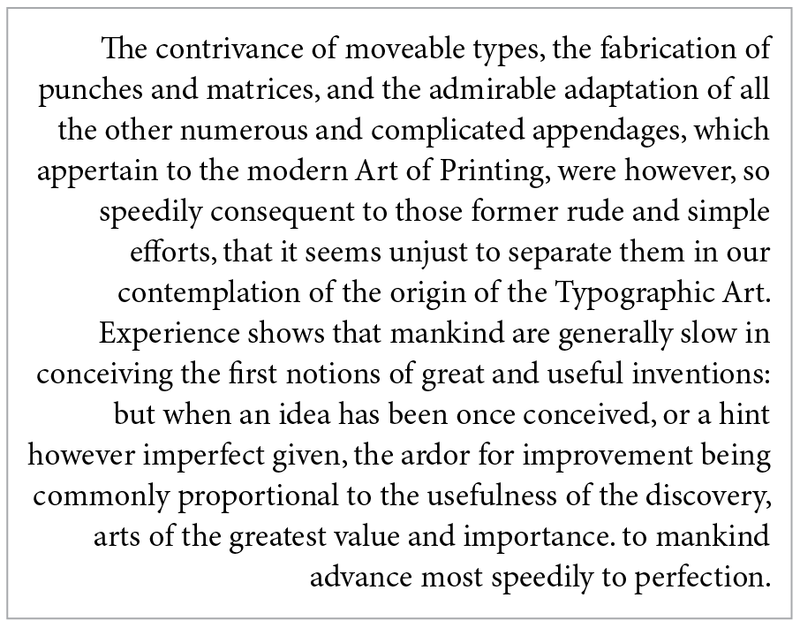 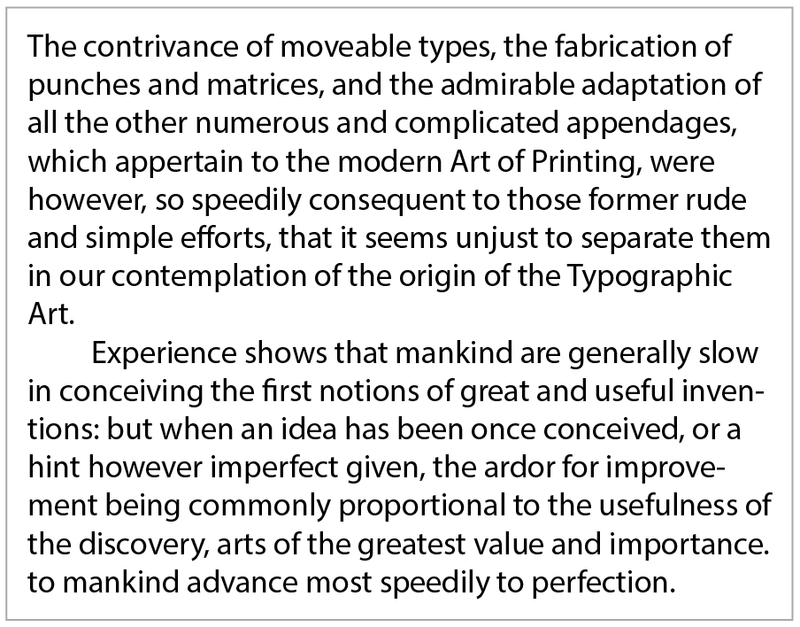 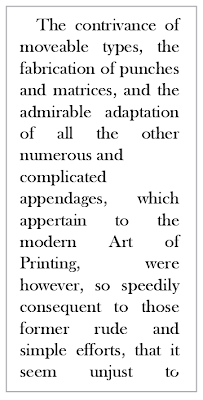 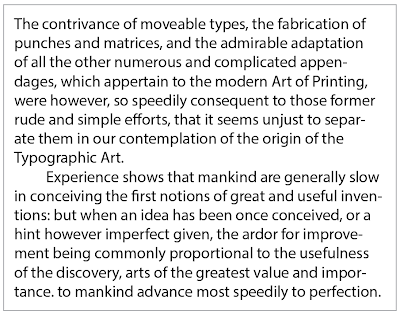 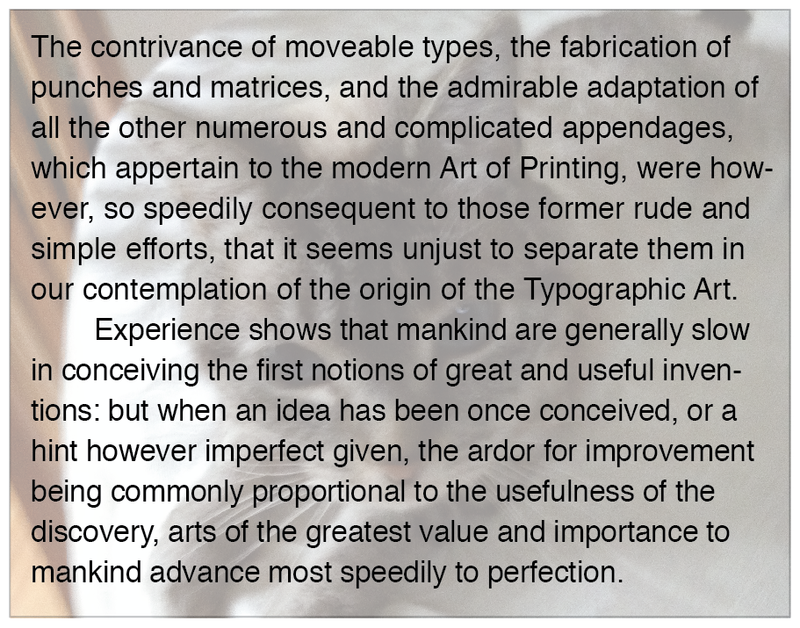 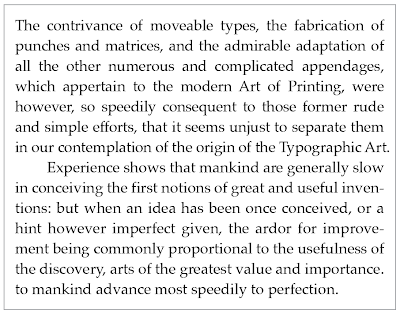 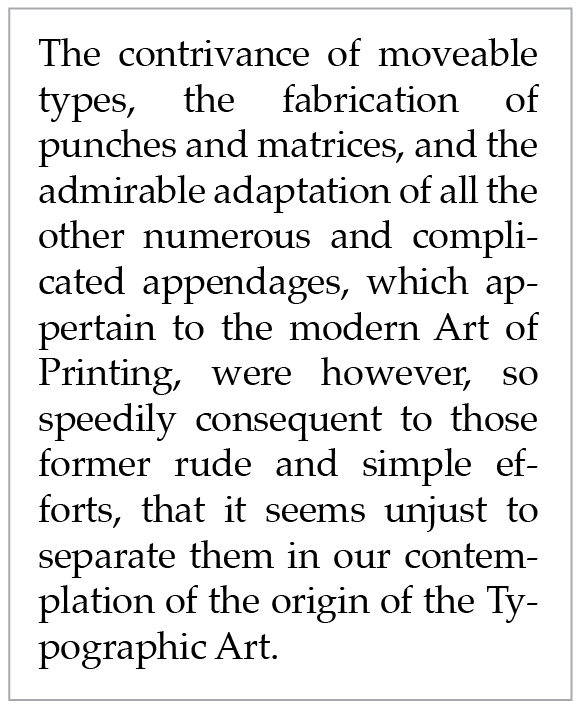 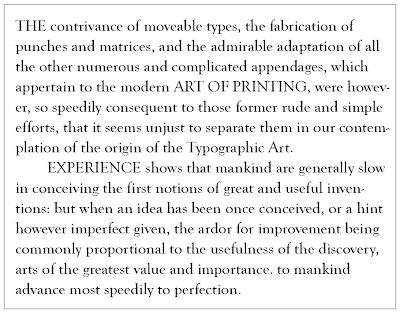 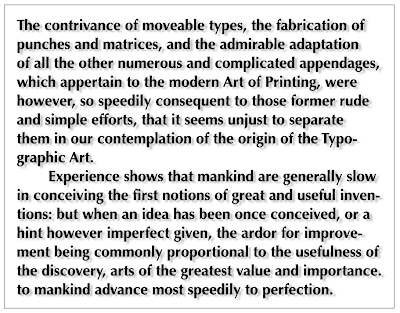 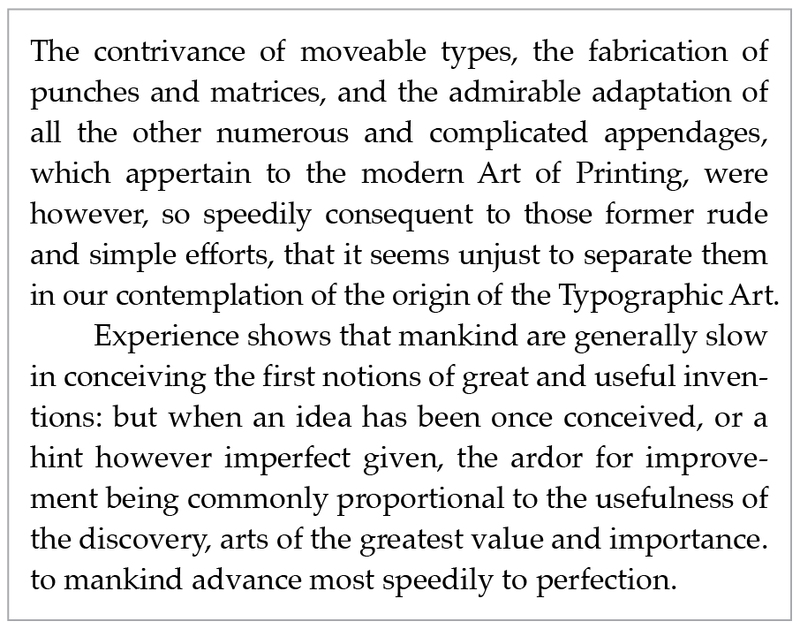 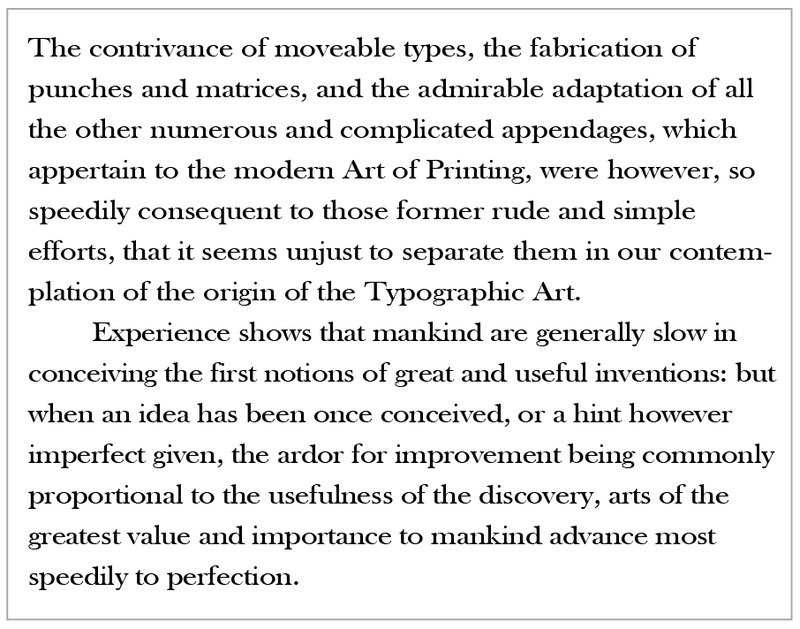 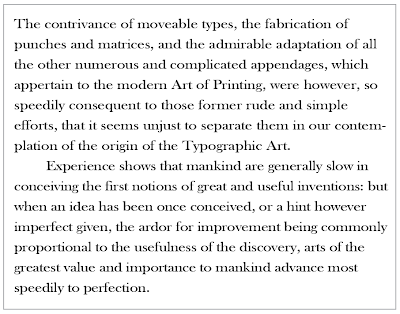 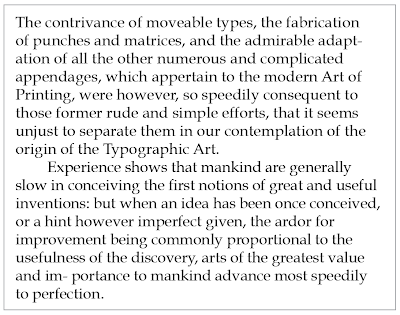 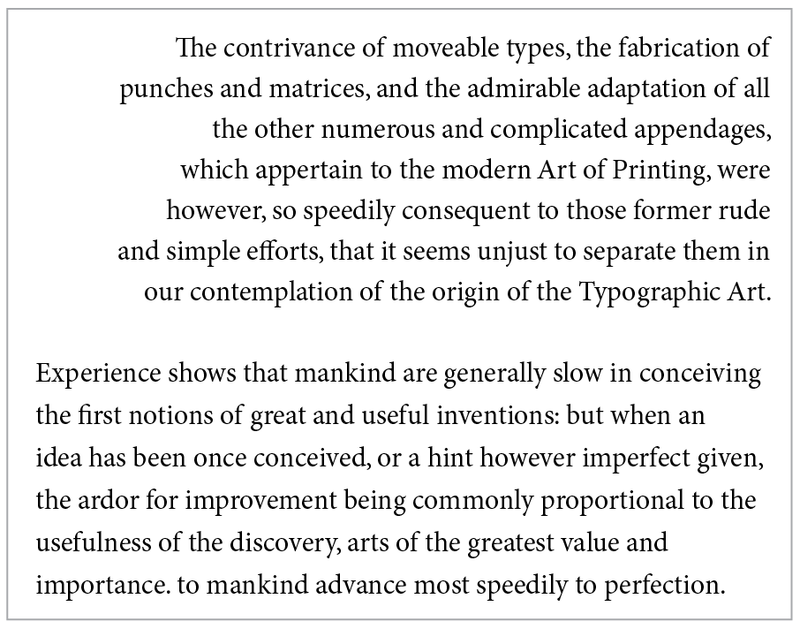 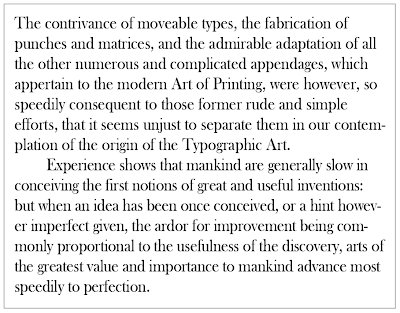 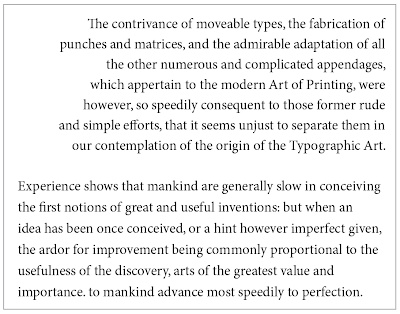 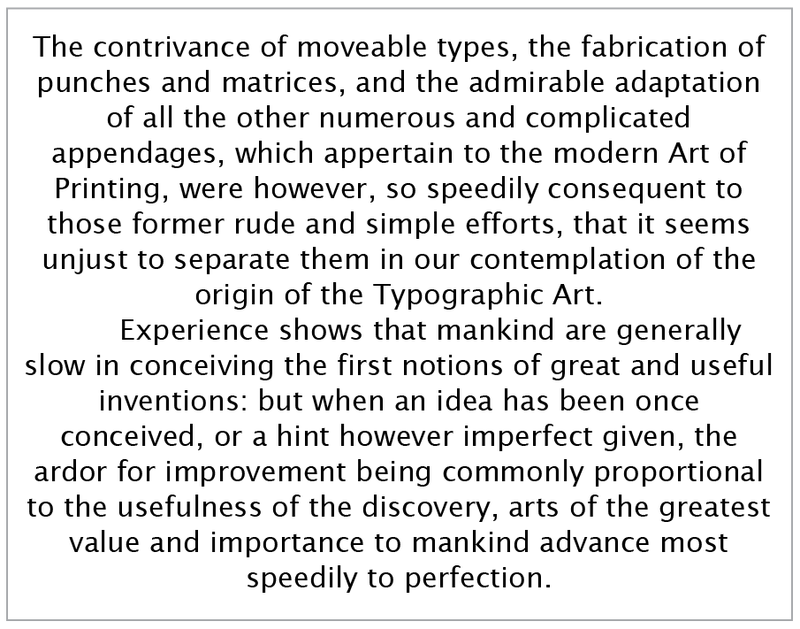 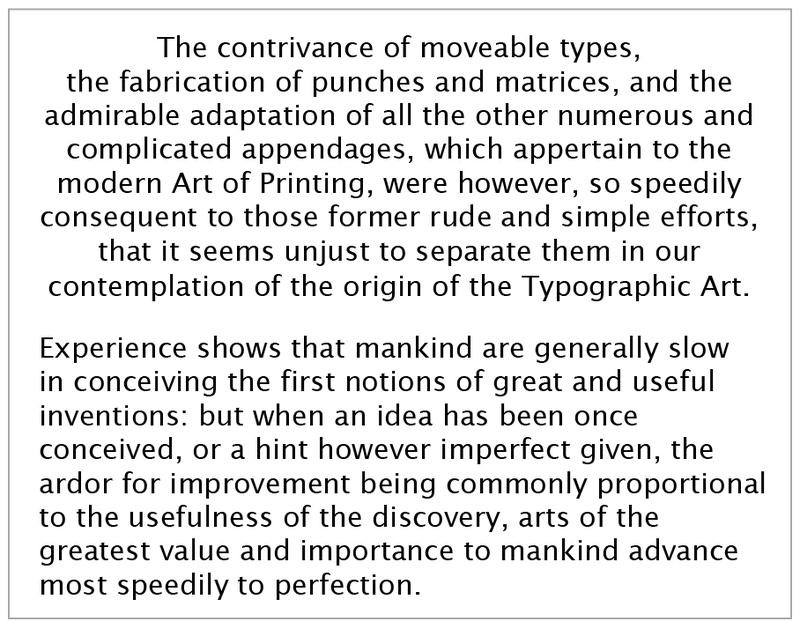 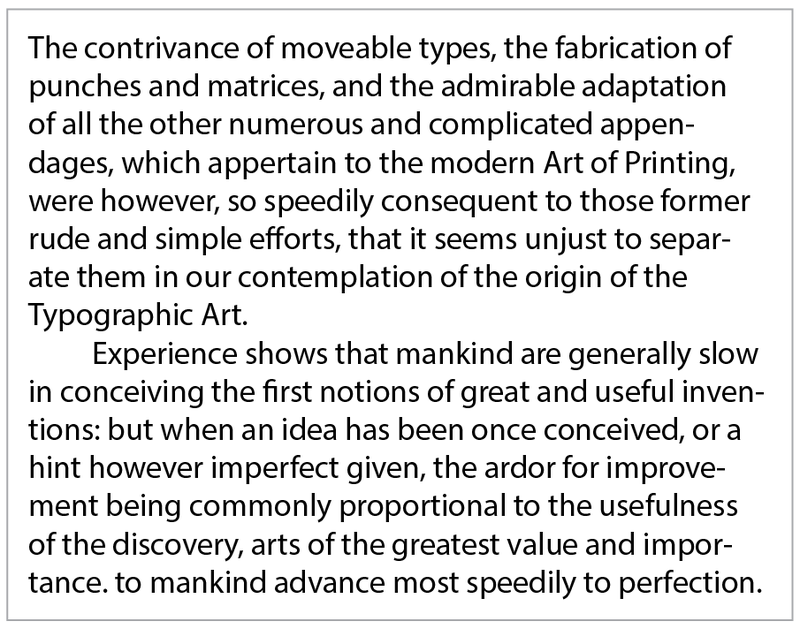 The statement used in the examples below is an excerpt from a treatise on typography written in 1818 titled Annals of Parisian Typography, by William Parr Greswell. 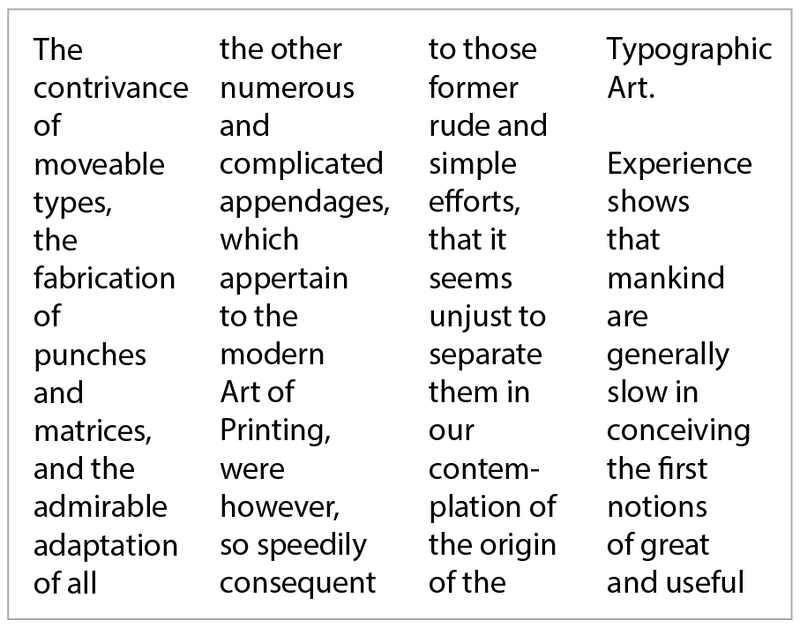 Don’t allow a single word line or “widow” to occur at the end of a paragraph. 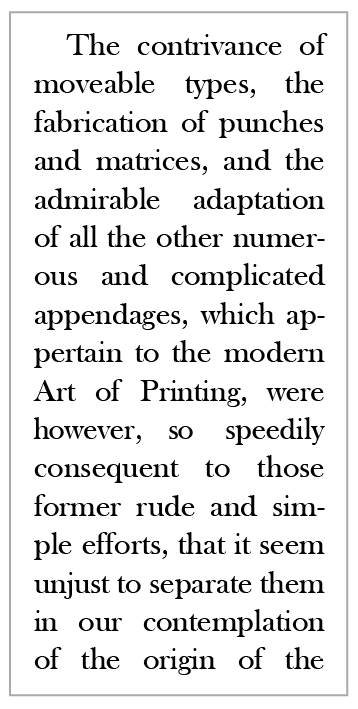 Do alter paragraph line endings to change the “rag” and eliminate a widow. 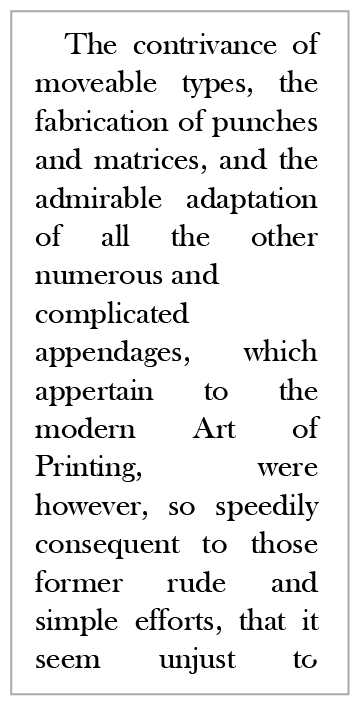 Don’t indent the first line of an article or chapter. 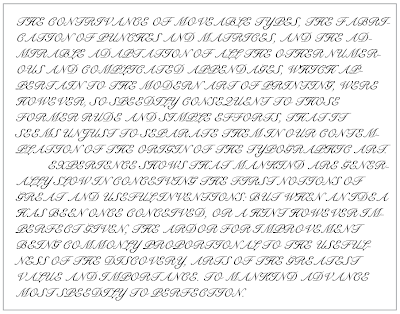 Do remove the indentation. 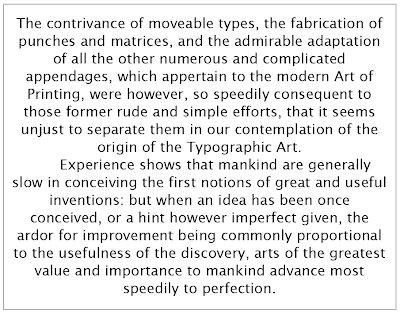 A first paragraph should not be indented. 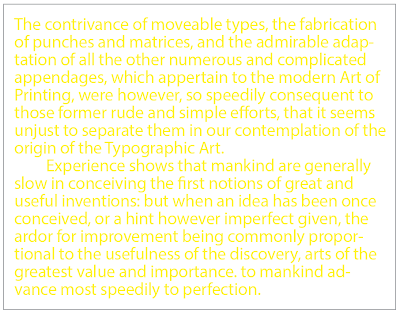 Don’t use a color for text that is difficult to read. 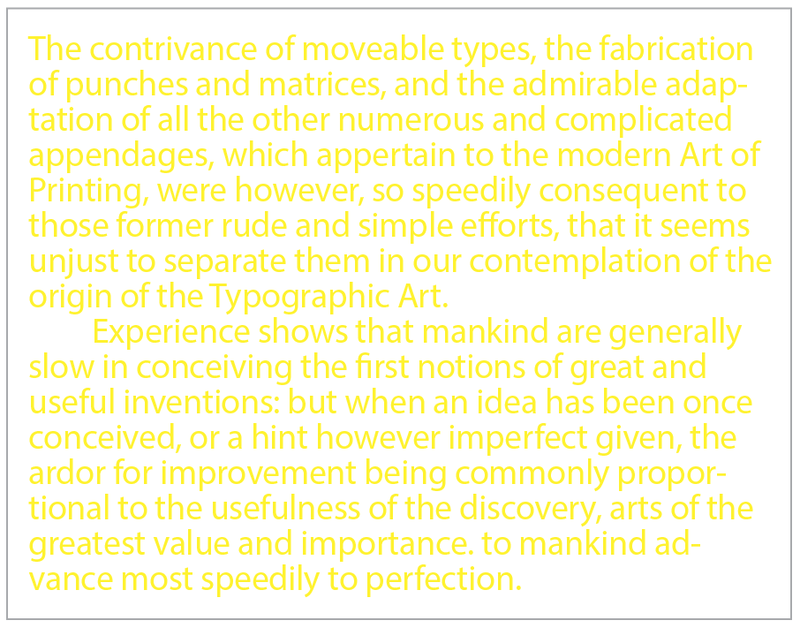 Do choose a text color with adequate contrast to the background. 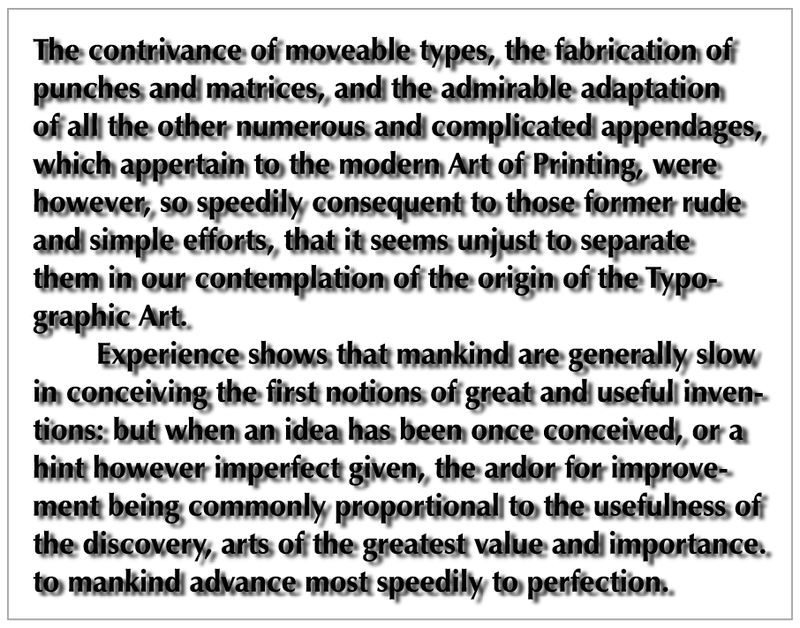 Don’t choose a display font style that is difficult to read. 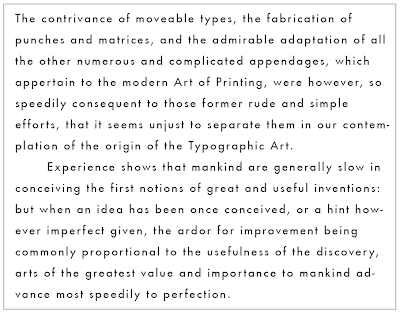 Do use display fonts sparingly for short statements or portions of a statement. 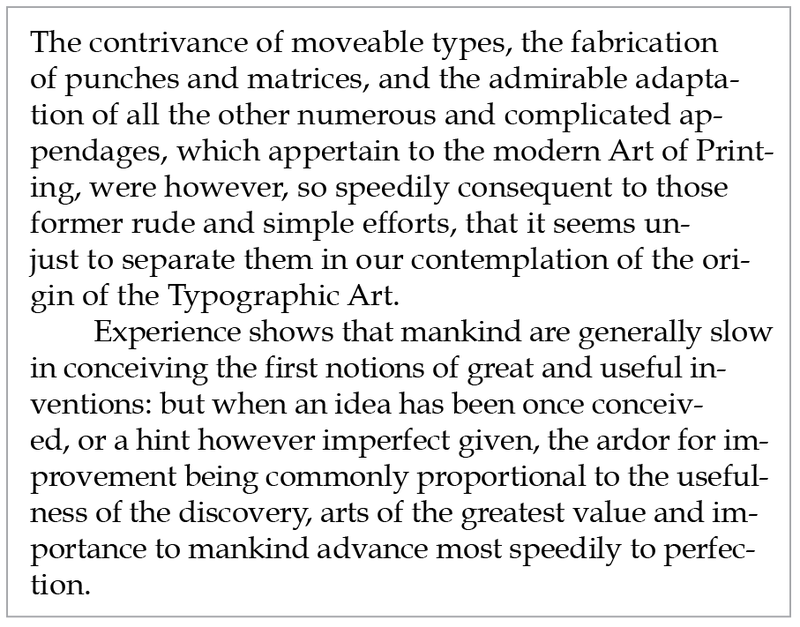 Don’t set paragraph text in all capital letters. 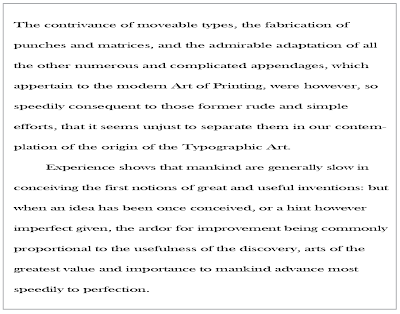 Do use all capital letters for single words, single sentences, or short statements. 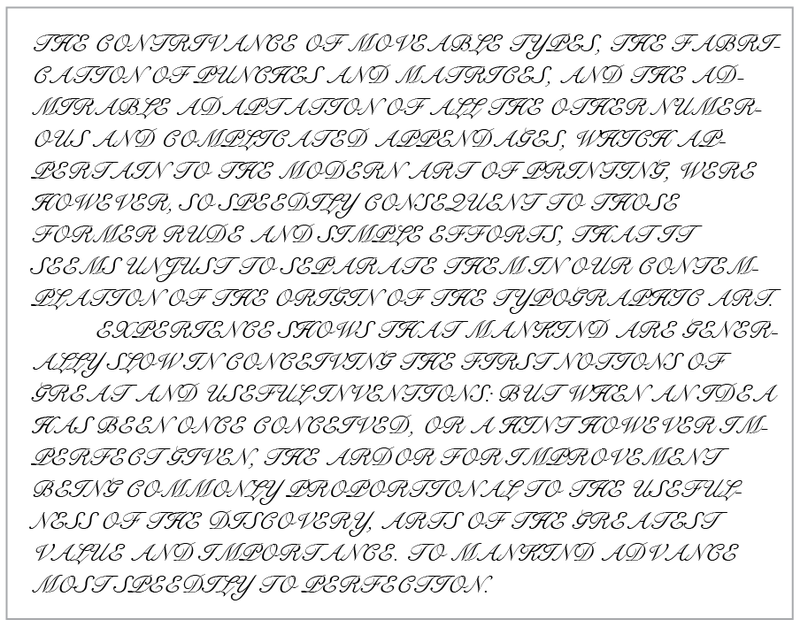 Don’t use fonts with ornate capital letters for all cap statements. 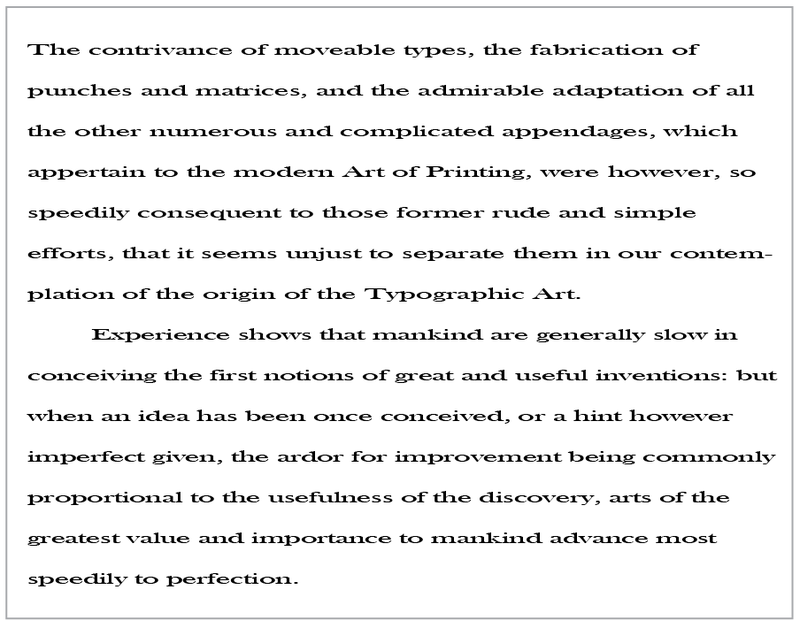 Do use ornate capital letters only at the beginning of sentences. Don’t choose excessively bold fonts for long bodies of text. Do choose reduced weight fonts for paragraph use. 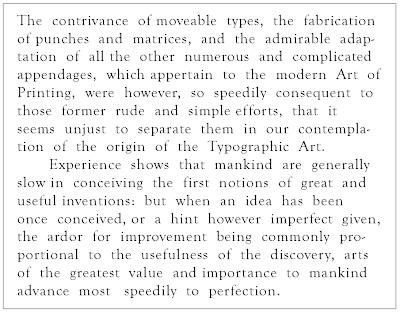 Don’t set text solid or use negative line spacing. 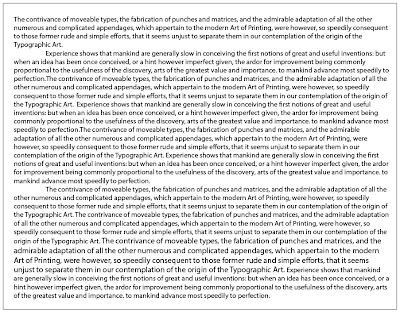 Do add space between lines or use default spacing for the point size in use. 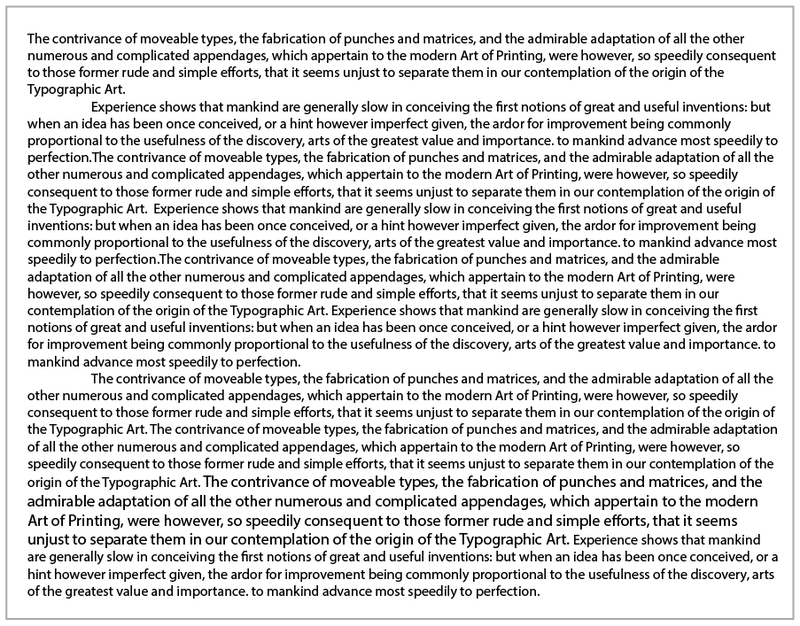 Don’t use an excessive amount of word space for paragraph text. 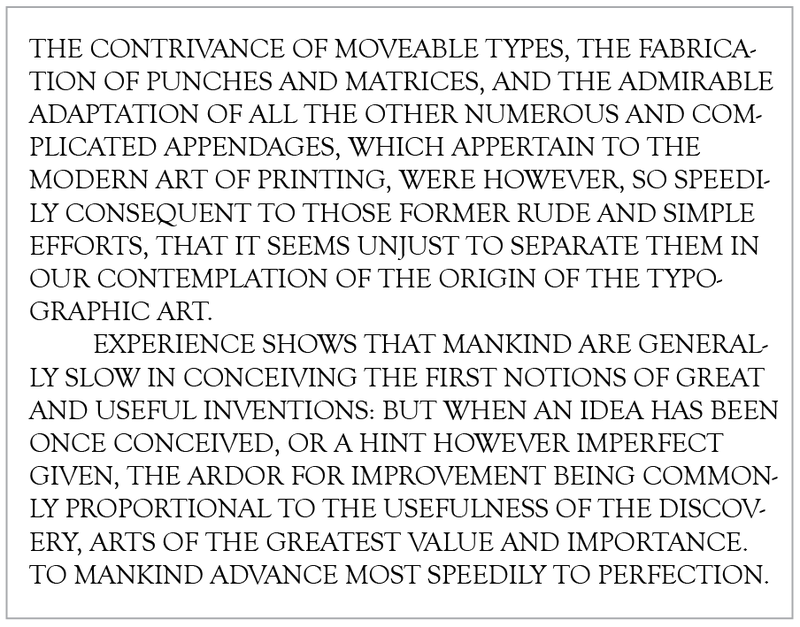 Do use default or slightly reduced spacing. 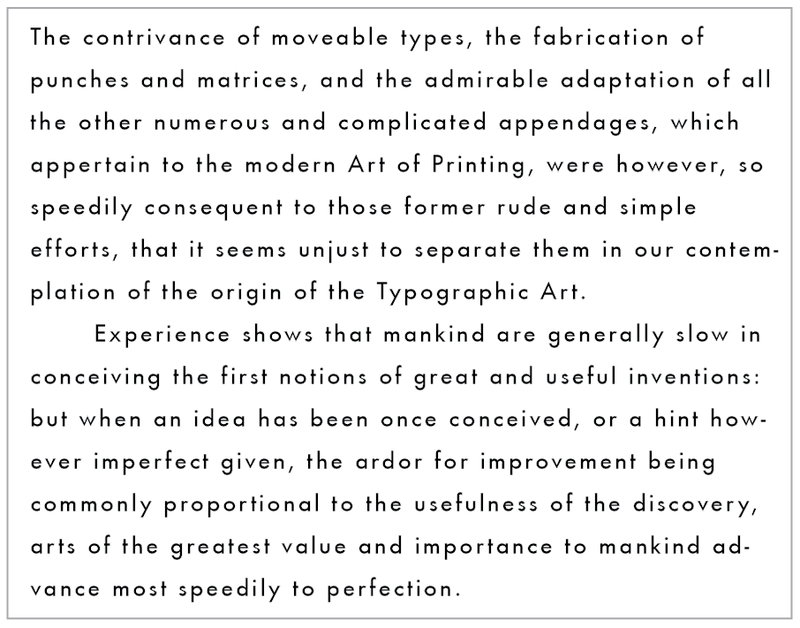 Don’t use an excessive amount of letter space for paragraph text. 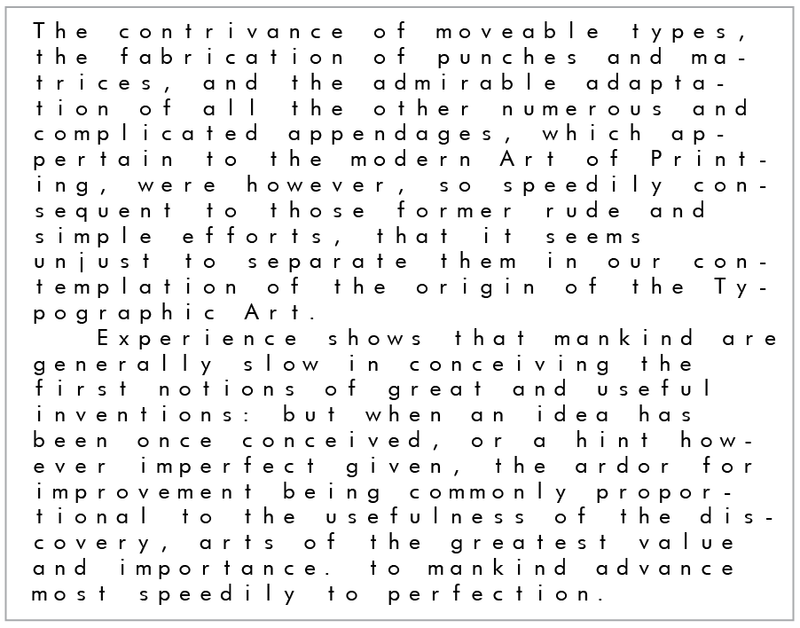 Do use letter spacing in a moderate amount. 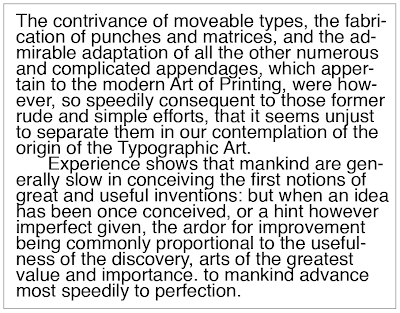 Don’t set text in long lines or “measures”. 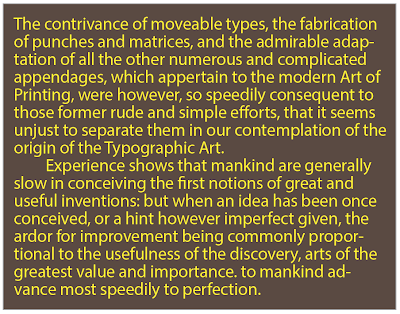 Do limit the average length of lines in a paragraph to no more than 12 words. 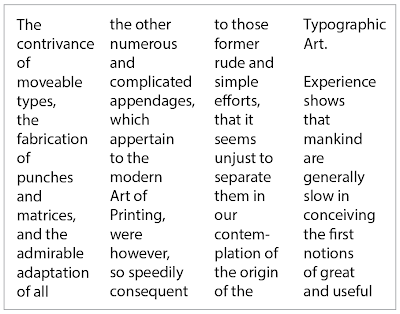 Don’t set type flush on both sides or “justified” in short measures. 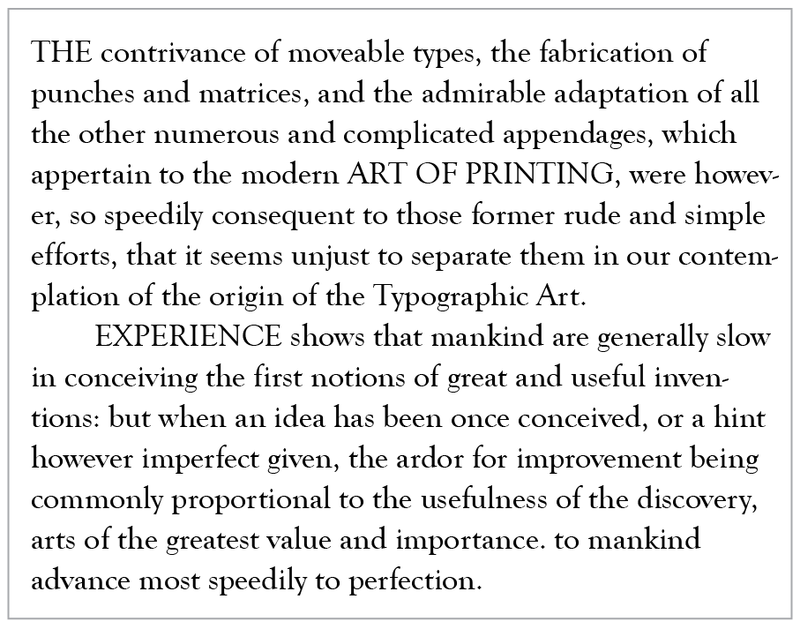 Do set type as justified in wider measures. 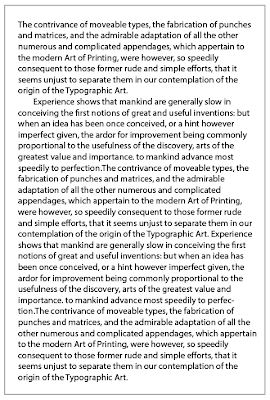 Don’t allow auto justification to create "rivers and lakes". 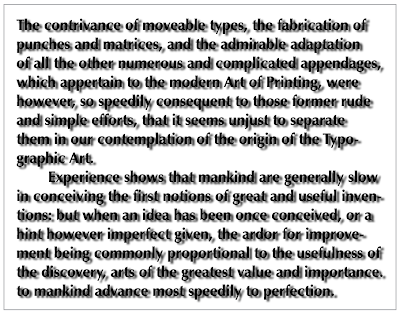 Do manually adjust justified text to improve rivers. 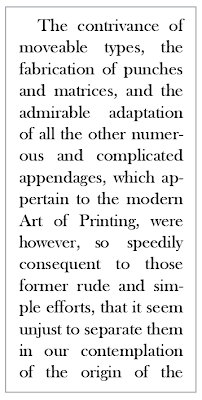 Don’t set a chapter or story flush right, ragged left. 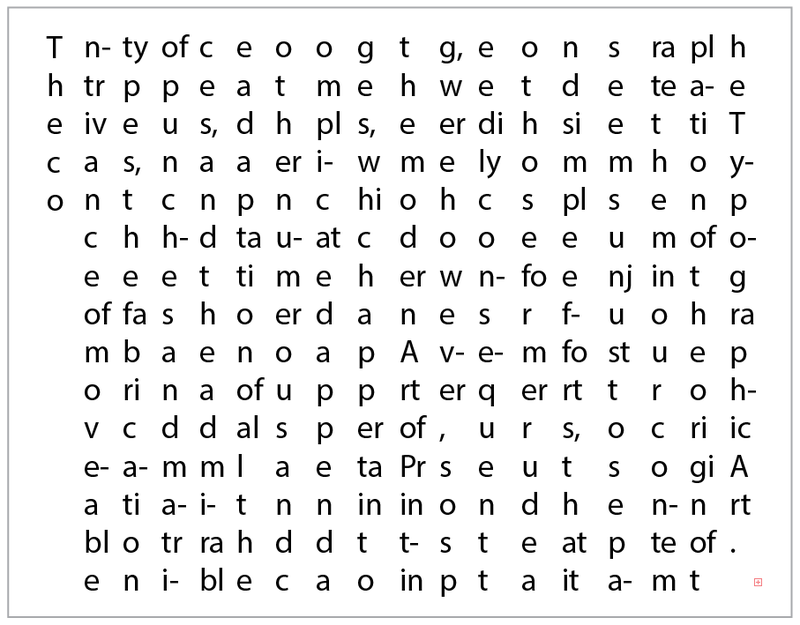 Do use flush right, ragged left for shorter statements or call outs. 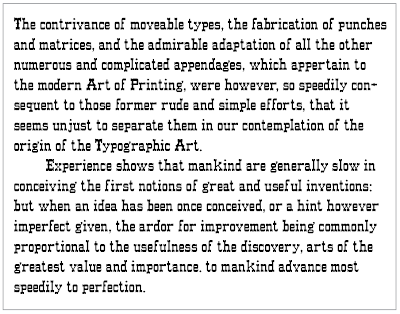 Don’t set a chapter or story as centered text. 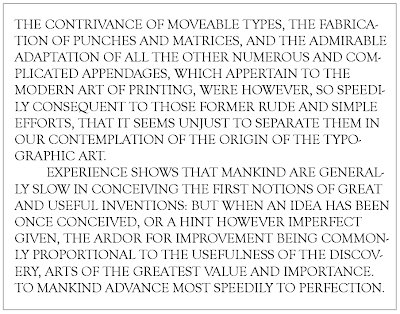 Do use centered text for shorter statements or call outs. 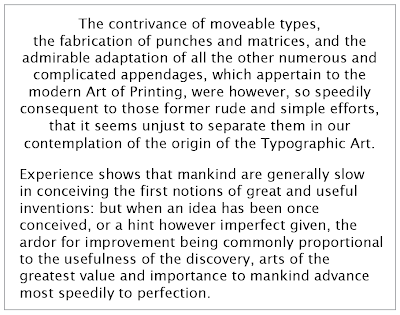 Don’t allow excessive hyphenation to occur in a paragraph. Do change the rag so that no more than two adjacent lines are hyphenated. 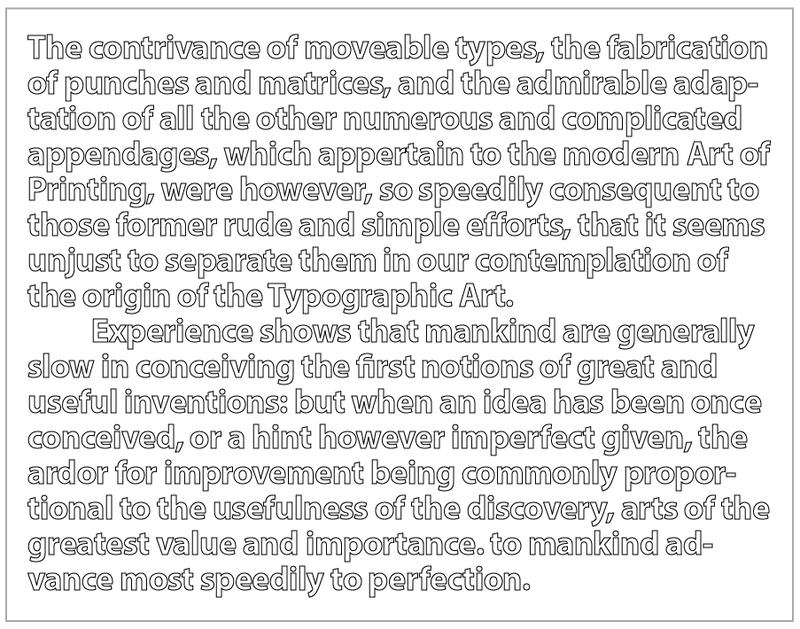 Don’t excessively compress a font horizontally. 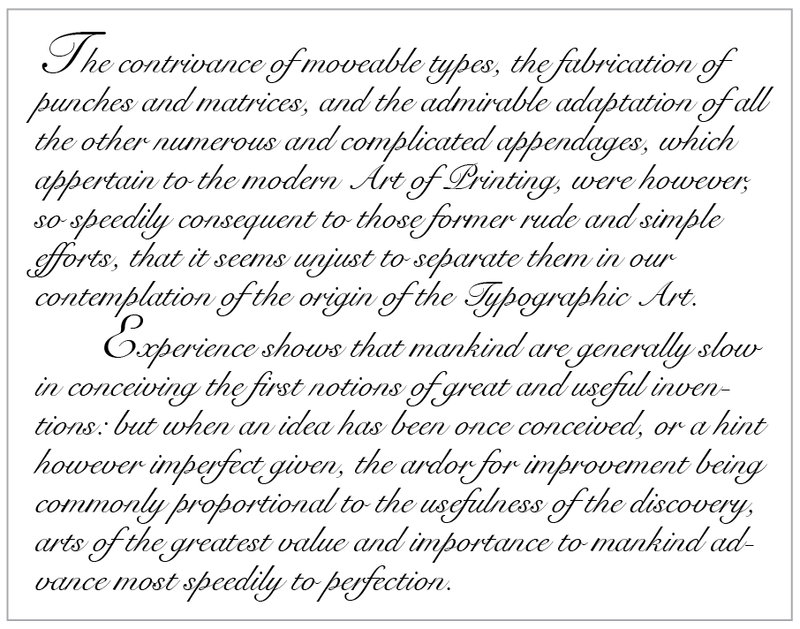 Do use original letter proportioning or find a font designed to be condensed. 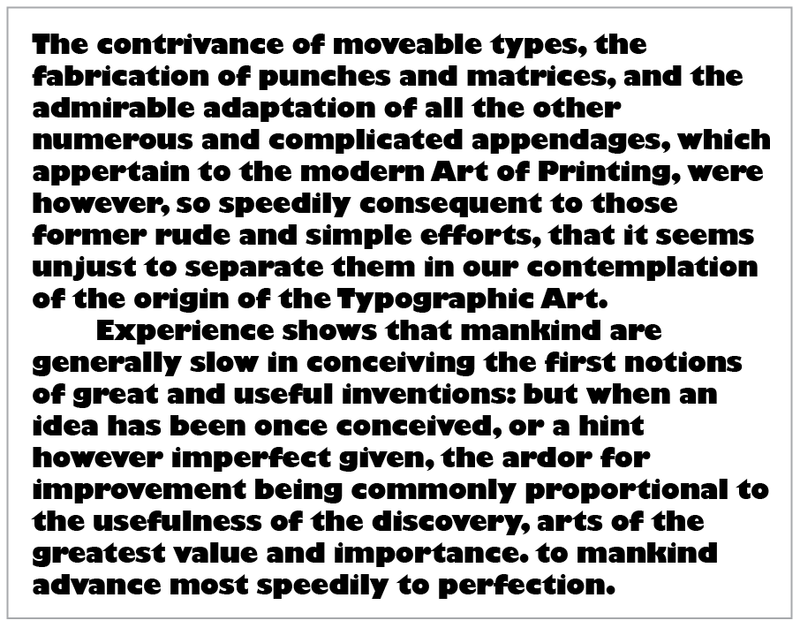 Don’t excessively vertically compress a font. 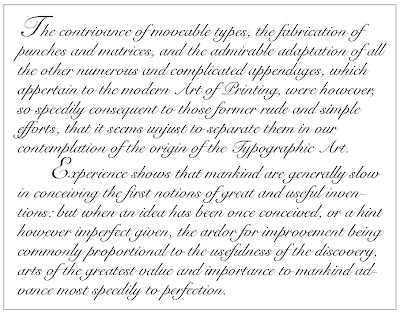 Do use original letter proportioning or find a font designed to be extended. 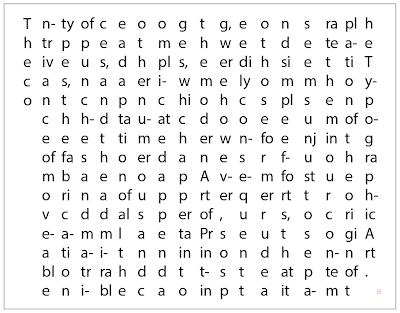 Do set words in vertical columns, but only sparingly if necessary. 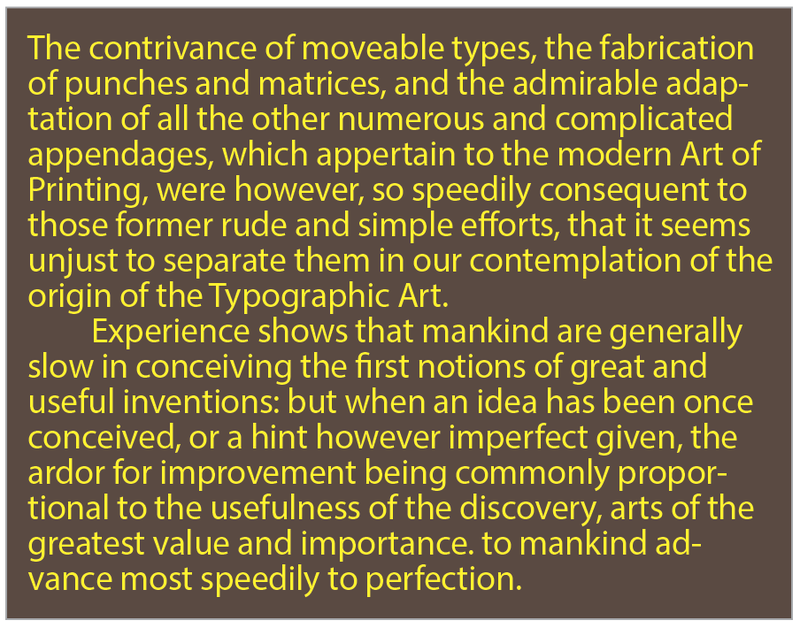 Don’t use outline type for large bodies of text. 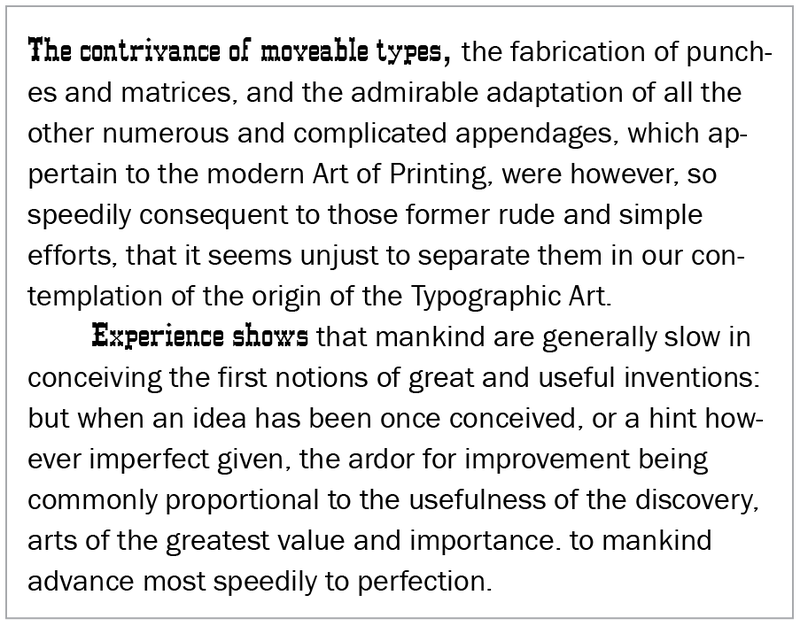 Do use outline type for short statements or contrast, but only sparingly. 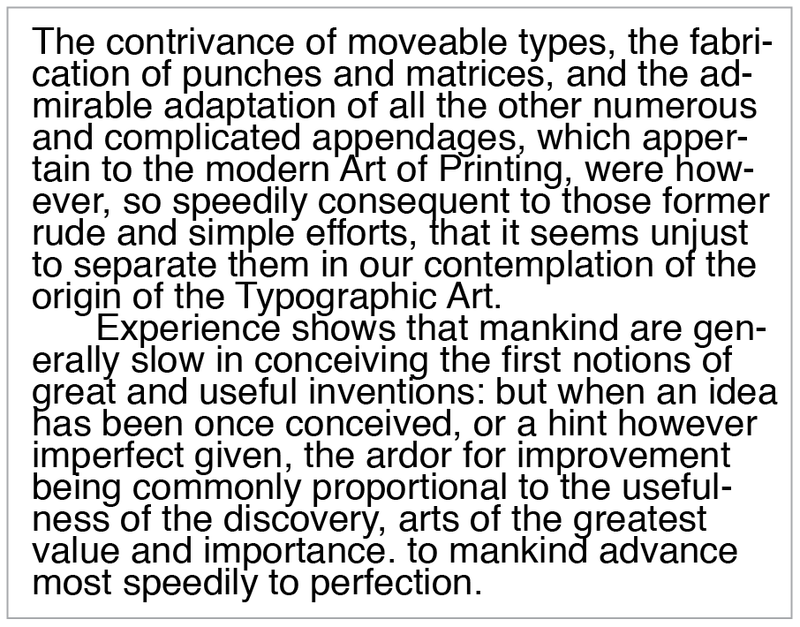 Don’t apply excessive visual effects to paragraph text. Do use visual effects subtly and with restraint. Don’t set dark type over images with detailed or contrasting elements. 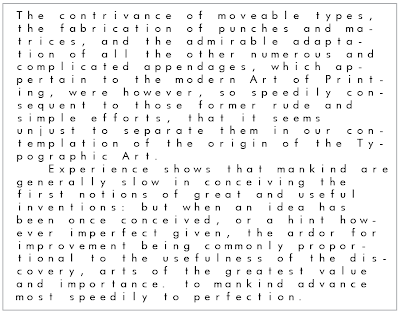 Do lighten or “dodge” the image to improve the readability of the text. 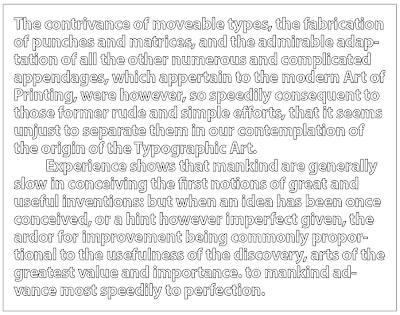 Don’t set white type over images with detailed or contrasting elements. 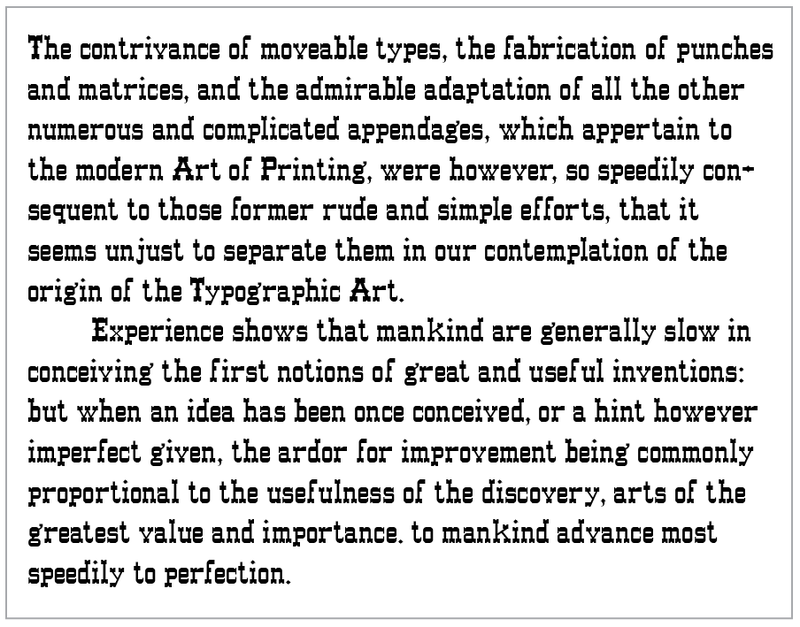 Do darken or “burn” the image to improve the readability of the text.